Retail sales in Indonesia, where consumption accounts for the largest to the GDP growth, drifted higher in November year-over-year amid rising demand of clothes, fuels for automotive and recreation and cultural-linked products, a survey carried out by the central bank showed here on Wednesday. Bank Indonesia has announced that only 15 percent of foreign exchange earnings to October 2018 had been converted into rupiah. Indonesia’s Agriculture Ministry has announced that the export of horticultural commodities grew significantly last year, with fruit exports jumping 26.27 percent compared to the previous year’s figure. Exports of copper concentrate from Indonesia’s Grasberg mine, the world’s second-largest copper mine, are expected to drop to 200,000 tonnes this year from around 1.2 million tonnes in 2018, an official at the Energy and Mineral Resources Ministry said on Wednesday. Alibaba’s cloud computing unit has opened a second data centre in Indonesia, doubling its local capacity and pushing its global coverage to 55 availability zones across 19 regions. Data from the government of Indonesia shows that a drive to build more than 1 million homes a year has, for the first time, hit its target. Indonesia wants to work with other Asean countries to strengthen the regional architecture through Indo-Pacific cooperation, Foreign Minister Retno Marsudi said in her annual speech on Wednesday (Jan 9). Trash-filled waterways are quite a common sight in Indonesia, but a village in the Bekasi Regency of West Java managed to make headlines around the country for letting their water pollution problem get way out of hand, even by the country’s lamentably low environmental standards. The government has lowered the investment target for new and renewable energy to US$1.79 billion this year from $2.01 billion in the previous year. Scientists in the United States said on Tuesday they had taken a major step toward developing a ‘mosquito birth control’ drug to curb the spread of malaria and other killer diseases blamed for hundreds of thousands of deaths a year. Global mobile data technology company Skyroam has launched its new virtual SIM application in Indonesia after securing approval from the Indonesian government. At this time of the year, the agriculture story in Benguet would be about frost nipping at cabbage and other vegetables. Indonesia is juggling between two options as it moves closer to setting regulations on the adoption of electric vehicles. The Indonesian Ministry of Foreign Affairs held an international press conference in Jakarta on January 9 to review its work in the past time and announce diplomatic priorities for 2019. The Jakarta-headquartered Asia Pulp & Paper (APP), which is a part of the Indonesian Sinar Mas Group, on Wednesday signed a memorandum of understanding (MoU) with the Andhra Pradesh Economic Development Board (APEDB) to develop a 5 million tonnes per annum greenfield pulp and paper plant in Prakasam district. President Joko Widodo (Jokowi) presented three thousand land certificates to the residents of West Jakarta, here, Wednesday. The Central Java provincial government is committed to developing gas-fueled mass transportation modes to make the province environmentally friendly and to help reduce congestion. The Indonesian Exporters Association (GPEI) is seeking incentives from the government for the use of local raw materials to manufacture its products. The government is in talks with private companies that have expressed interest in constructing solar panels for houses and other buildings, as the government does not allocate funds for such projects. State airport operator PT Angkasa Pura I served 4.6 million passengers during the Christmas 2018 and New Year 2019 holidays. Corruption Eradication Commission (KPK) leaders Agus Rahardjo and Laode Syarif faced terror threats yesterday, with unknown assailants placing what appeared to be bombs at their houses. One of the first arrests of a senior Indonesian politician on corruption charges in 2019 went down in dramatic fashion early this morning after the former head of Surabaya’s Regional Representatives Council (DPRD) attempted to flee from arresting officers, running over a motorcycle in the process. Three Indonesian members of a ship crew, abducted in the waters of Congo on October 29, 2018, were released and reunited with their families in Indonesia. The police will intensify security around Corruption Eradication Commission (KPK) leaders’ homes following suspected bomb attacks at the houses of chairman Agus Rahardjo and deputy chairman Laode Muhammad Syarif on Wednesday morning. Coordinating Minister for Politics, Legal, and Security Affairs, Wiranto, said the public should not create an uproar following the bomb threat in the houses of the Corruption Eradication Commission (KPK) leaders. The case, he stressed, would be investigated based on the prevailing law. 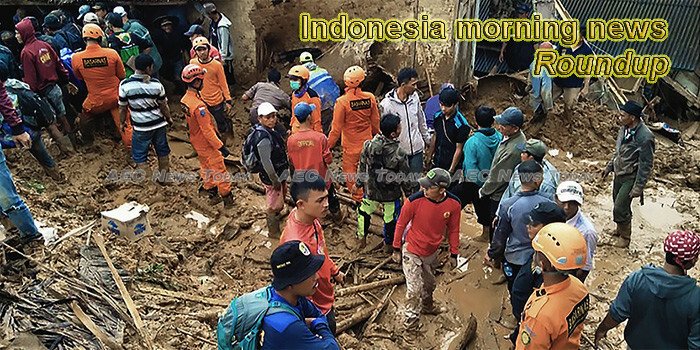 Intellasia East Asia News Indonesian authorities have extended the emergency period in the area affected by Sunda Strait tsunami on December 22, so as to provide more effective measures on dealing with those affected. The government has accelerated the development of temporary post-disaster housing for victims of the earthquake, tsunami, and liquefaction in Palu, Central Sulawesi, Vice President Jusuf Kalla said. TCL, top three global television brand and leading consumer electronics company, today debuted its latest artificial intelligence (AI. IDN Media’s target readers include Millennials and Generation Z age group IDN Media, a multi-platform online media company based in Indonesia, today announces that it has raised a Series C funding round led by EV Growth.